Springfree Trampolines take regular trampolining to an entirely new, safer level. If you’ve never had a chance to check out Springfree Trampoline reviews, now is your chance to check it out. Springfree Trampoline reviews have caught massive attention because of how innovative they actually are. Springfree Trampolines have a unique design that use flexible mat rods for a safe, non-jarring experience. Springfree Trampolines have trampolines that start from as little as $1199 USD and go up to $2349 USD, which begs the question – are they worth it? Let’s find out! 3 Springfree Trampoline Reviews – Are They Worth It? 4.1 Are Springfree Trampoline’s worth the money? 4.2 Do Springfree Trampolines bounce well? 4.3 Can you put a Springfree trampoline in the ground? 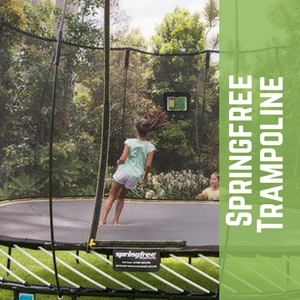 4.4 Why are Springfree trampolines so expensive? 4.5 Can you repair a Springfree trampoline? 4.6 How do you clean a Springfree trampoline? 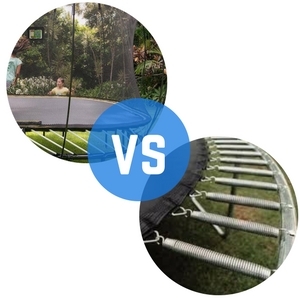 The difference between springless trampolines and trampoline springs is one that’s pretty self-explanatory A springless trampoline does not have the springs that traditional trampolines have. Springless trampolines replace the traditional springs for other materials, such as fiberglass rods and bungee cords, for example. Unfortunately, using fiberglass rods to replace traditional springs is somewhat of a safety concern. The rods can snap and release shards, damaging the support structure of the trampoline and potentially harming anyone using the trampoline. Using bungee cords instead of traditional trampoline springs is, thankfully, much safer. They’re fixed to the mat and aren’t easily detached, not to mention they don’t hurt if you land on them. Although, they have a short lifespan because of the weather elements and can degrade from UV rays over time. Springfree Trampoline constructs their trampolines using flexible composite rods located beneath the jump surface of the trampoline, completely out of the way. They use a hidden frame located underneath the surface of the jump pad, as well, making it impossible to hit. Springfree Trampoline has passed safety concerns with flying colors. Their smart, springless design ensures that the impact areas most responsible for injuries are completely eliminated. Their SoftEdge mat is more shock absorbent than traditional safety pads and completely blocks any hard edges. Springfree Trampoline offers incredibly durable trampolines. They are built to last and rigorously tested to ensure they are up to the highest of standards. As proof, they offer a 10-year warranty for the entire trampoline, not just bits and pieces. They also feature the FlexiNet safety enclosure, which bounces the jumper back into the center of the trampoline if they fall into the sides of the netting. The FlexiNet is made using flexible net rods which prevent anyone from falling off the sides or out of the trampoline enclosure. Springfree Trampoline Reviews – Are They Worth It? In closing, Springfree Trampoline make innovate, durable, safe trampolines that are worlds better than traditional trampolines with springs. For one thing, the 8×11 ft Medium Oval Trampoline is the perfect choice for families with kids of all ages. It maximizes your backyard’s space, is designed for families of a smaller size, and is the perfect size. 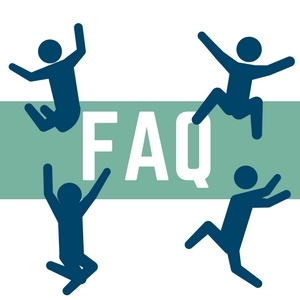 If you don’t see your question listed below in our FAQ section, get in touch with us and we’ll help you out! Are Springfree Trampoline’s worth the money? Absolutely. They are worth their weight in gold when it comes to having a safe, durable trampoline that won’t pinch your fingers and have you potentially getting injured from falling on or off the edge. Do Springfree Trampolines bounce well? Compared to traditional trampoline springs, the bounce you’ll have from a Springfree Trampoline trampoline is very similar. Bouncing will feel different, however, thanks to the SoftEdge mat. Instead, bouncing will be smoother and less jarring. Can you put a Springfree trampoline in the ground? Even though it’s likely possible to do, you should not put them in the ground. You can actually cause damage to the trampoline and any jumpers who use it. Why are Springfree trampolines so expensive? Trampolines by Springfree Trampoline are on the expensive side because they are highly durable, use a lot of safety features, and are arguably the safest trampolines on the market. Not to mention the 10-year warranty that’s available, as well. Can you repair a Springfree trampoline? Yes, you can. The best way to do so, however, is to first call their customer care team to ensure that you are making any needed repairs the correct way. How do you clean a Springfree trampoline? Cleaning a Springfree trampoline is incredibly easy to do. All you need to do is wipe the mat using a light dish detergent and some water. Although, if you have a power-washer, that will work, as well. Never use soaps that are chemical-based, they may corrode the material.